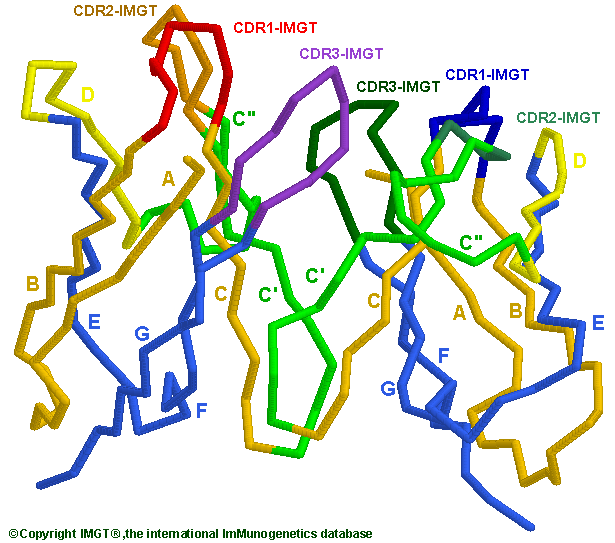 A V-DOMAIN corresponds to the V-J-REGION or V-D-J-REGION of the immunoglobulin and T cell receptor chains. IGH V-D-J-REGION: CDR1-IMGT (red), CDR2-IMGT (orange), CDR3-IMGT (purple). V-DOMAIN strands are colored according to the IMGT color menu for strand representation: A, B and C strands (orange), C' and C'' strands (green), D strand (yellow), E, F and G strands (blue). This image has been generated with the program RASMOL version 2.6 from the PDB file 1dvf, containing the atomic coordinates of the complex between Idiotope D1.3 -Antiidiotope E5.2. Both D1.3 (1dvf_A, 1dvf_B)and E5.2 (1dvf_C, 1dvf_D) are mouse antibodies (Mus musculus) IgG1, kappa. Only the D1.3 Fv is displayed here. IMGT 2D and 3D representations (examples) in IMGT Repertoire.